Ongoing studies try to quantify the risks and benefits of contact sports. (Inside Science) -- Gerry Gioia’s 3-year-old grandson already enjoys kicking a ball around. He might grow up to be an athlete, like his mother and his grandfather. Gioia hopes organized sports will give his grandson a lifetime of fun, friendships, lessons about endurance and loss, and countless physical benefits. But if he wants to play football or another contact sport, will he be safe? That’s the hardest question for doctors like Gioia to answer. As the 2017 NFL season kicks off, it’s a question on the minds of parents, fans and players alike. But it's also on the mind of neuroscientists. 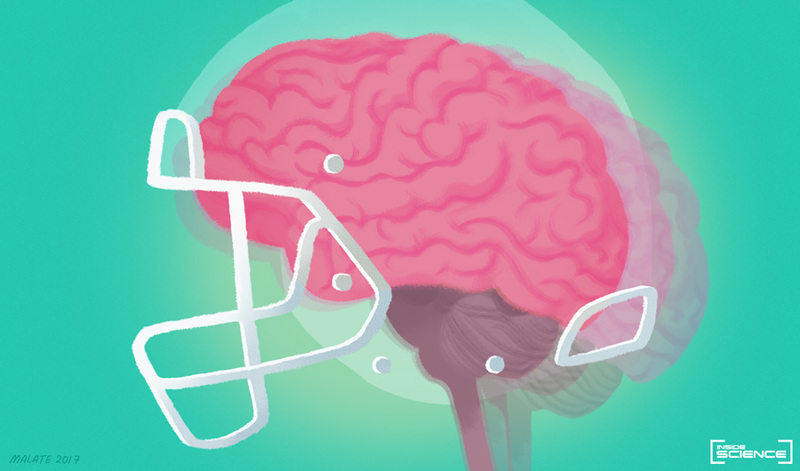 Figuring out how science can help answer many of the unresolved questions about brain injuries -- and how to make contact sports like football safer -- remains a major problem for neuroscientists to tackle. A concussion is the most common type of traumatic brain injury and results from forceful trauma like a football tackle, a car crash, a bad fall, or a bomb blast. A growing body of evidence suggests that repeated impacts, both those that cause concussions and those that don't, can wreak havoc on the brain, leading to dementia and neurological problems later in life that can persist long after any initial symptoms have faded. But understanding impacts, concussions and their effects, both immediately and through the course of a person’s life, remains one of the most tangled questions in neuroscience. Video: How Do Doctors Define Concussion? The short-term and long-term effects of subconcussive impacts are currently poorly understood and difficult to study. But even concussions are not something scientists can study in a typical clinical setting, because there’s no good way to introduce a control group, comprising people with a similar physical build and activities, but without experiencing head trauma. What’s more, animal models of traumatic brain injury represent very different physical activities from, for instance, a running back sprinting toward the end zone and colliding with a defensive end, or a soldier who suffers a head injury when her Humvee is rocked by a roadside bomb exploding. Further, diagnoses themselves are somewhat subjective, and based in part on a patient’s description of his or her injury. There are no definitive biomarkers of concussion -- no way to definitely diagnose it by looking for telltale signs in drawn blood, for instance, or in CT scans or MRIs of the brain. Some scientists argue that what we currently call a concussion is actually a spectrum of injuries. They play out in different ways in different people, from a molecular to a psychological level, said Chris Giza, a neuroscientist at UCLA and director of the Steve Tisch BrainSPORT program. These issues complicate physicians’ efforts to untangle questions like how the brain responds to a concussion and how repeated concussions can add up to lasting damage. Their ultimate goal is to help parents and adults better assess the risks of certain contact sports and to determine how sports may be modified to protect people of different ages and physical attributes. Dr. Christopher Giza examines Kennedy Dierk, 14, at the UCLA Steve Tisch BrainSport Clinic. There is no gold standard for diagnosing a concussion, Giza said; a clinician’s diagnosis is based in large part on his or her experience, what the patient says, and what any witnesses say about the nature of the injury. While some researchers are studying eye-tracking, cognitive tests, blood markers and imaging signs to clearly define concussion, in many clinical settings, it remains subjective, Gioia and Giza both said. Giza quipped that brain injuries are like snowflakes, in that no two are alike. Understanding what happens on a molecular level could also point toward treatments or even pre-game or pre-deployment strategies to make people more resilient to injury, either by preventing the damage in the first place or by training people’s bodies and brains to make them more likely to heal both cognitively and physically. “It could be something like building neck strength so you are less likely to get a concussion if you get punched in the head. Or it could be building up a reserve, a neurological or cognitive reserve. These are things we’re just scratching the surface on,” Giza said. Animal models may help researchers develop diagnostic tests and point the way toward therapies and preventative measures, both Giza and Gioia said, but current models are imperfect. That leaves clinical studies that compare different groups of people to fill in the knowledge gap. A few have attempted to draw correlations among brain injury, chronic neurological decline and football -- most notably a provocative study published in June in the medical journal JAMA. Researchers from Boston University and several other nearby institutions studied the brains of 202 deceased football players, whose brains were donated. They found chronic traumatic encephalopathy, a degenerative brain disease, in 87 percent of all subjects -- including, most notably, 110 of 111 NFL players. Though the findings were stark, the authors acknowledged the study had its limitations, like the fact that the samples were selective, likely including people who experienced significant neuropsychiatric decline later in life, which may have prompted their family members to donate their brains. It also had no control group, a sample of people in a similar situation who did not experience chronic traumatic encephalopathy. Giza and other critics have argued that the study's lack of a control group and the non-random sample undermines its impact. One study with such an aim is a multi-year, multi-center study called the Concussion Assessment, Research and Education (CARE) Consortium, a joint program of the Department of Defense and the NCAA. It will examine 30,000 college athletes and military cadets to compare people with similar physical backgrounds, not all of whom will experience traumatic brain injury throughout their careers. But it could take years to show results, let alone to make headlines, said Giza, who is a collaborator in the study. Meanwhile, some researchers argue that research on football and brains should also include a discussion of the benefits of sports. Concussions are common across youth sports, including in soccer, hockey, rugby and many others, and they frequently present in both young male and female athletes. The medical literature is packed with evidence that organized sports confer plenty of physical and psychological plusses. But Giza said that they are often overlooked in discussions of the risks of contact sports. Gioia, now 61, was captain of his high school football team for three of four years, where he alternated among defensive lineman, punt returner, running back, punter and quarterback. He also played in college, but quit after deciding it wasn’t fun enough anymore and played rugby instead. “I’m not a big guy, but I was fast and quick, so I took a lot of contact,” he said. While acknowledging that he could have just been lucky and that today’s game is much different than the one he played as a young man, he points out that his own experience shows not everyone who plays contact sports develops long-term cognitive decline. Indeed, another study published in the journal JAMA–Neurology, the same week as the BU study, argued that football itself could confer some protection against depression and other neurological disorders. In that study, Sameer K. Deshpande and colleagues studied football players who were also participants in the long-term Wisconsin Longitudinal Study, which has followed students who graduated from Wisconsin high schools in 1957 throughout their lives. Among 3,904 men in the study, there was no statistically significant harmful association between playing football and reduced cognition, Deshpande found. The study compared football players with people who played a non-collision sport and people who did not play any sport. Football players were also less likely to exhibit depression symptoms as compared to those who didn’t play the sport. “Playing high school football could have a beneficial effect,” the study found. Gioia and Giza are quick to point out that no one would argue concussions are a good thing and that football can indeed be dangerous. “Don’t get me wrong, I love it when a beautiful play occurs, and one of my New York Giants scores a touchdown. But at the same time, I will scream at the television when I see plays that are dangerous and put players’ health at risk,” Gioia said. Ultimately, research like the Wisconsin longitudinal study illustrates that it’s complicated. Scientists still need better animal models, more robust diagnostic measures, and more thorough, long-term studies to determine how contact sports and concussions affect people throughout their lives. Editor's note (September 12, 2017): This story has been corrected to reflect that Chris Giza is involved with the Concussion Assessment, Research and Education (CARE) Consortium. We regret the error. Rebecca Boyle is an award-winning freelance journalist covering astronomy, zoonoses and everything in between. She is a contributing writer for The Atlantic and her work regularly appears in Popular Science, New Scientist, Aeon, Wired, and other publications for adults and kids. Follow her on twitter: @rboyle31.